HOLLIS (WABC) — Police and family members are asking for help locating a missing woman in Queens. Rajwinder Kaur, 26, has not been seen or heard from since leaving her home on 198 Street Sunday night, according to investigators. “She always comes home. She always lets us know where she is,” Gurpreet Kaur, her sister, said. She left their Hollis, Queens home on her way to volunteer at a Brooklyn homeless shelter, but less than two hours later, Gurpreet says she received a cryptic message that sent chills up her spine. “I received a text message from her basically saying that the girl with this phone is dead, was smiling. I thought it was weird. My sister would never send something like that,” Kaur said. There was no response. The family called in police. They’re also mounting a five borough search of their own, enlisting relatives and friends to post flyers near shelters and other agencies where Rajwinder might have volunteered. “To see if anybody knows her, to see if any at the shelter recognizes her anything like that so that’s what we’re doing right now. You’ve got to be worried sick? Very worried beyond comprehension,” Gary Kaur, her brother, said. The Kaurs describe Rajwinder as a very devout Sikh and a former social worker who spends most of her time either at home or volunteering to help those in need. They are praying that someone will help them find her. “We just want to tell her we love her and we hope she’s okay and she comes home soon,” Gurpreet said. 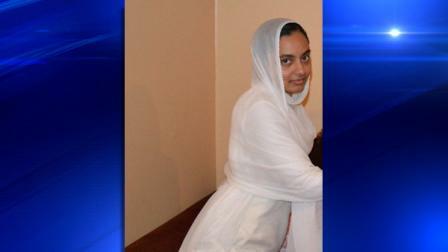 Kaur is described as 5’03” in height, 130 lbs, thin build with a medium complexion. Anyone with information is asked to call Crime stoppers at 1-800-577-TIPS (8477). You can also submit tips by logging onto the Crime Stoppers website at www.nypdcrimestoppers.com or by texting tips to 274637 (CRIMES) then enter TIP577. Let us hope that Rajwinder will be found safe and sound. ← Is being American a religion on its own? Rajwinder Kaur has been found and she is okay and safe. Thank you for the information. Glad to hear she is safe.